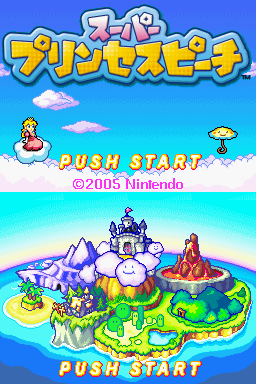 Usually, the "Princess" in "Princess Peach" is written in Japanese games with the kanji "姫," but in this game's title it's written in katakana. The copyright dates were updated for the U.S. release, and "Push Start" was changed to "Press Start." Before coming to the U.S., the L and R Button graphics were redesigned to look more like the actual buttons on the Nintendo DS. 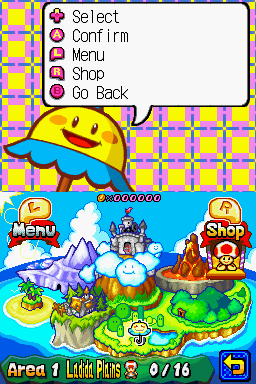 The screen shots below show two designs: Purple icons in Perry's text box, and bigger, yellow graphics on the touch screen. 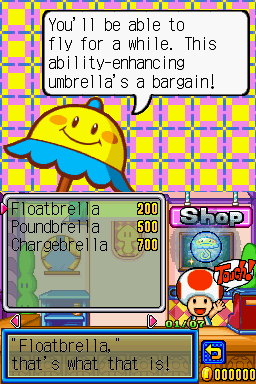 Toad's shop has fancier price labels in the U.S. version. "Kassā" in the Japanese ability names comes from kasa (umbrella, parasol) and is the name of Peach's parasol in the Japanese version. Bowlbrella: "Donbura" is from donburi (porcelain bowl). 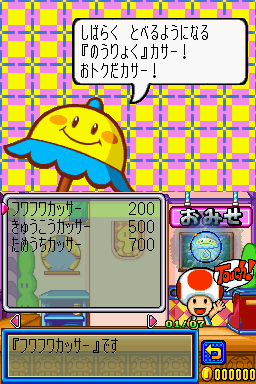 Floatbrella: Fuwafuwa means "light, airy." Vibe Island: Its Japanese name, "Kido Airakku," comes from kidoairaku (human emotions). Hoo's Wood: "Mōri" is a play on mori (woods). Shriek Mansion: The word hyūdoro is a ghost noise (hyūhyū represents the sound wind makes). Fury Volcano: "Mukamu Kazan" is play on mukamuka (surge of anger). Gleam Glacier: Shiku Shiku is an onomatopoetic word that means "sobbing, crying." Perry: Similar to how his English name "Perry" comes from "parasol," his Japanese name "Kassā" is from kasa (umbrella, parasol). This section compares the list of names provided by the in-game glossary in both versions. 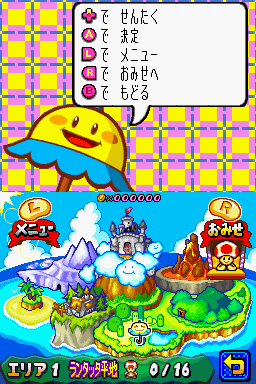 For some of the enemies that first appeared in Super Mario Bros. 3 and Super Mario World, Super Princess Peach is the first game to show their names in kana (Japanese script) inside the game itself. Some names were abbreviated in the U.S. version to save space, so we've added the full names in parentheses under the enemies affected. Blurp: Bukubuku is onomatopoeia for a bubbling sound. Bob-omb: Usually, his Japanese name "Bomuhei" is shown as a mixture of katakana and hiragana, but in this game, the hiragana portion "へい" (hei) is replaced with the kanji "兵." Boss P. Plant: The boss called "Boss P. Plant" is better known as Petey Piranha. Chain Chomp: Wanwan is equivalent to "bow-wow." Cheep Cheep: Pukupuku is derived from bukubuku (bubbling sound). Fang: "Pasapasa" is derived from basabasa, a rustling sound. Hoo: "Mōri" is a play on mori (woods). Lil' Sparky and Hothead: Their Japanese names "Keseran" and "Pasaran" come from keseranpasaran, which is a fluffy, round seed from a weed. Paragoomba and Paratroopa: Patapata is a flapping sound. Ptooie: Fūfū is the sound of heavy breathing. Starfish: The "Starfish" enemy resembles Starfy from The Legendary Starfy, a game series made by the developers of Super Princess Peach. Starfy had starred in three Japan-only games before Super Princess Peach was released. Thwomp: "Dossun" is from dosun, a "whomp" noise. Urchin: "Unira" comes from uni (sea urchin). Special thanks to Matt W. for translation help!